This book is a strong complement for any one of our national prelicensing texts. When used together, you will be fully prepared for all the Connecticut state-specific license laws and regulations needed to pass the state portion of the licensing exam. 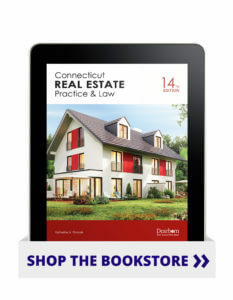 You will receive updated state information in this new edition, including when agents must use agency agreements, municipal authority on property tax abatement, Statute of Frauds revisions, dual agency regulations, and brokerage requirements for retiree licenses and nonresident licensing. This text also includes an updated practice exam, with answer key and rationales, to provide a more comprehensive learning experience that highlights essential state-specific concepts.